Ten albums in and as a follow-up to a successful double album that many doubted the band could manage, it's good to hear Soilwork experimenting with their sound and moving it further onwards. After all, when you compare the band with peers In Flames, it's easy to see who deserves the kudos more, Soilwork actually trying new things and avoiding the temptation to be too radio-friendly. At one point new melodeath albums were met with horrified gasps, but most bands of that tradition seem to be making an effort to be interesting – look at the last few Dark Tranquillity albums, for instance. So I appreciate the effort put into making The Ride Majestic an interesting listen, and fans of the band will love it, even if it's far from the best album they've made. We do get more, but only later in the album. This is where The Ride Majestic stutters, as it just can't keep its focus. Death in General is a typical mixture of prog-tinged groove and aggressive balladry, mixing clean singing with Strid's usual bellowing – good, but after Alight in the Aftermath's freshness is jarringly normal. It's like Soilwork are afraid to move out of their comfort zone and really do something shocking, so we get hints of this limited experimentation weighed down by the need to stick to the heavy/light formula. Prog tendencies are, as mentioned, woven through the band's output and it seems closer to that genre than melodeath frequently; Father And Son Watching The World Go Down and Petrichor by Sulphur both good examples. Then comes the complete wildcard that is The Phantom, sounding like a different band as downright blackened riffs and an absolute screech comes from Strid, soon reverting to his usual harsh vocals but keeping the new riffs and sounding much darker all in all. And then, a clean chorus, and back to normal! Maybe I'm wrong to expect more from Soilwork than a different twist on the usual, but it does make for a frustrating listen when you have these undoubtedly talented musicians throwing in little hints of what they can do beneath the usual. 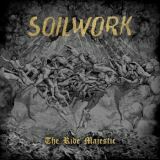 It's a very solid if forgettable usual, to be fair to Soilwork, and I've enjoyed the time spent with The Ride Majestic – it's just a shame that they can't be truly revolutionary. The songwriting is solid, catchy and heavy as appropriate, and with these hints of experimentation and increasingly weird song title choices Soilwork are making more interesting choices and taking more risks than, say, At The Gates did with their comeback of last year. Fans will be pleased. Yet I can't help but wish for more, as decent as this is.